Writer Pens The Life Of Author Gabriel Garcia Marquez Gabriel Garcia Marquez is the most widely-read Latin American author alive today. The writer, a winner of the Nobel Prize for literature, is a master at spinning tall tales with the details of his own life. That proved to be a challenge for Gerald Martin, who has spent the past 17 years working on the just published biography, Gabriel Garcia Marquez: A Life. Gabriel Garcia Marquez is the most widely-read Latin American author alive today. The writer, a winner of the Nobel Prize for literature, is a master at spinning tall tales with the details of his own life. 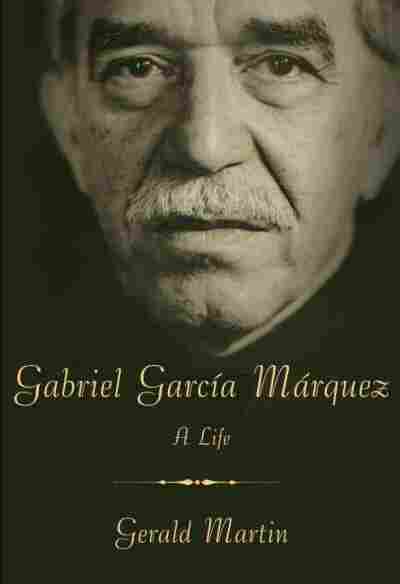 That proved to be a challenge for Gerald Martin, who has spent the past 17 years working on the just published biography, Gabriel Garcia Marquez: A Life. Gabriel Garcia Marquez is the most widely read Latin-American author alive today. Winner of the Nobel Prize for literature, the Colombian writer is best know for the novel "One Hundred Years of Solitude." He's also well known for being a teller of tall tales when it comes to his own life, which made him a singular challenge for his biographer, Gerald Martin. Mr. Martin spent the past 17 years working on the just-published biography "Gabriel Garcia Marquez: A Life." And Mr. Martin joins us now from our New York bureau. Good to have you with us. Mr. GERALD MARTIN (Author): Thank you very much. Good to be here. NEARY: He was writing as a journalist for a number of years before his most - probably his most famous novel, "One Hundred Years of Solitude," was published. NEARY: And that book was very highly anticipated. I didn't realize it until I read your book just how much people were already sort of heralding it as a great novel before it was even published. Why was there so much expectation for him and for that book? Mr. MARTIN: I think, for a start, there was already this big movement that was just about to be called the boom in Latin-American fiction in the 1960s. There were lots of writers around who were going to be top writers who are known to anybody who reads these days, like Fuentes and Vargas Llosa and so on. But it wasn't so clear that there was a movement, but there were people who wanted a movement. So that was the one thing. There was a need for an even bigger book. But I think the biggest thing of all is that the book made - I mean, I can still remember - I was a young man then. I was in Mexico City. I read the book six months after it came out. And you had to be there at the time. You had to be in the 1960s. You had to be in the world of the Beatles and Third World revolution, psychedelia, lots of things, to understand now what impact the first page of that book had. It just seemed to be a kind of writing that everybody'd been waiting for. They didn't know they were waiting for it till it came. It was just one of those zeitgeist things. The first two lines, the first time you read them, you just felt, I've read this before. Where does this come from? Which is what he felt when he first, himself, thought up the first line of the book. NEARY: Can you remind us of what those lines are? Do you have them memorized? Mr. MARTIN: More or less. It's almost correct. Many years later, as he faced the firing squad, Colonel Aureliano Buendia would remember that distant day when his father took him to discover ice. It's a very strange beginning of a book, and it's also an incredible beginning to a book, because it's circular. It's got so many tenses in it. It's so strange. And it just seemed what was needed. And then, people felt that, and they had such immediate confidence in the book that when Garcia Marquez had only half completed it, they started to publish chapters in newspapers around Latin America. I mean, this is something that just had never happened. And so, it's almost as if he was seen as a bestseller writer at an era when no one in Latin American ever sold more than, you know, more than 2,000 copies of books. So there was something we all say now - and, in a way, it sounds like hype. We all say there was something magical about the moment and the book. But certainly, this had never happened before, and it's never happened since in Latin American fiction. NEARY: Well, of course, Gabriel Garcia Marquez is known as the father of magical realism, which is a style of writing where the fantastic can happen, even in the most mundane circumstances. And in reading your book, especially the early part of the book, I was really struck by how, in his childhood, there seemed to be so many and even events that had that kind of fantastical element. Mr. MARTIN: Yes. One of the problems, of course, is knowing whether they really did, or whether it's the way he tells it. And I think there's no doubt that it was an extraordinary place to be born. I think it was an extraordinary house to be born in that he was born in, and I think a town where so many things were happening and so many nationalities were coming through. NEARY: Let's talk about that town. Mr. MARTIN: Yeah, sure. Okay. NEARY: Let's talk a little bit about that town and why it was such an extraordinary place and such a - to grow up. Mr. MARTIN: Well, the town was out of Cataca. It was about between five and 10,000 people in the 1910s. And the American United Fruit Company moved in there around that time, just before his grandfather moved to the town. And so you had a small Colombian town in which almost nothing was happening or had ever happened, which suddenly had this big, outside world arriving. It was an extraordinarily active place for somewhere that was so small. NEARY: Yeah. And he had this very close attachment to his grandfather, because he was raised in his early years by his grandparents, but a very close attachment to grandfather, the colonel. Tell us a little bit about that. Mr. MARTIN: Well, his grandfather had been a colonel in the Colombian civil war at the end of the 19th century, which had a kind of magical realist name of itself. It was called the Thousand-Day War. So his grandfather, Colonel Nicholas Marquez, had been a hero of that war. He then moved to this new town where things were happening and became one of the big guys of the town. And when Garcia Marquez was left with him and his grandmother, the grandfather became the most important person in his entire childhood, and in one sense, at least, the most important person in his entire life. NEARY: At one point, I think he told somebody my grandfather died when I was eight, and after that, everything was flat. Again, perhaps an exaggeration, but just an example of how important that man was to him. Mr. MARTIN: Yes, it is an exaggeration in the sense that, for a start, he was actually 11 when his grandfather died. But it's true that when the grandfather had the illness that lead his death, Garcia Marquez was eight. And it's also true that he said that every time anything's happened to him for the rest of his life, he's had a kind of impulse to tell grandfather. And, of course, grandfather hasn't been there for, well, quite a lot of years, now. NEARY: But even as a child, he was - and a as a young man, certainly, he was an irrepressible storyteller, it sounds like. He also loved to tell stories, didn't he? Mr. MARTIN: Yes, he did. And being, you know, how grandparents adore children and spoil them and all the rest of it and think that everything they do is wonderful because you're getting the chance to enjoy it all over again, I think he always had a ready audience, and there were lots of people always passing through the house. And I think the cleverer he got and the more stories he told, the more everybody applauded him. And so I think he did get that feeling which he's talked about later in life, that people love you if you tell stories. And so he's always told stories so that people would love him. Mr. MARTIN: And it certainly worked. NEARY: If you're joining us, you are listening to TELL ME MORE from NPR News. And we're talking with Gerald Martin, author of "Gabriel Garcia Marquez: A Life." Now, he grew up and he came of age at a time when Colombia and all of Latin America were going through a great deal of political upheaval, and he himself got caught up in those politics, didn't he? Mr. MARTIN: He did. He already had the background of his grandfather being a civil war hero. Then when he was 18 months old, there was a very famous massacre in a town very near to his town, which is really important in his work later on. And, of course, when he was a student in 1948, he was 21. He was a student at the university in the national capital, Bogota. There took place one of the most astonishing events in the whole of Latin-American history, when the liberal politician Gaitan was assassinated in the street. And his supporters literally burned the whole center of Bogota - and all of this at a time when there was a Pan American conference taking place in Bogota to set up what is now the organization of American states. And Garcia Marquez was in a cancion, in a boarding house 300 yards from where that happened. So that really initiated his extraordinary tendency then and in later life to tend to be around when big things happen. NEARY: The politics that were taking place in Latin America also coincided with a time of great creativity, especially among Latin-American writers, which, again, he was very much a part of. How did that influence him and influence his writing? Mr. MARTIN: Well, he's always talked about as the originator of magical realism, without one to boring, that's not entirely true. Magical realism was originating right then when he was a student in the late 1940s. There was Alejo Carpentier in Cuba. There was Miguel Angel Asturias in Guatemala. Although the thing about him is that he was less influenced at that time by these people who you would think would be his major influences, and he was actually more influenced by writers from this country, first Faulkner, then Hemingway - very unusual in Latin America, because, of course, most Latin Americans tended to follow what the French were doing rather than what people in the United States were doing. NEARY: Now, I have to say that in this book, he comes across as having a very sort of mischievous sense of humor. And as we've said, he likes tall tales. What's your favorite story about him? Mr. MARTIN: Oh, there's a good one. NEARY: Or maybe a favorite story that he told. Mr. MARTIN: When the Bogotazo took place, that big upheaval in Bogota in 1948, it happened that Fidel Castro was there. And Garcia Marquez had disgracefully pawned the typewriter that his parents gave him for his 21st birthday, and that typewriter got lost in the riots. It was looted. But Fidel Castro, the first he did during the Bogotazo, because he was there, was to smash a typewriter on the ground. And Garcia Marquez swore to Fidel Castro that that was his typewriter. So that's the kind of tall tale that he tells. And sometimes, he seems to believe them. Who knows? NEARY: Do you think it will be his most enduring legacy, ultimately, that book? Mr. MARTIN: I think so. You can make arguments for lots of other books, and some people think that some of his other books actually are more perfect pieces of literature. And, of course, he himself has always had a rather difficult relationship with this book. He often says it's just full tricks. But I personally think that it is the Latin-American novel. So many Latin-Americans tell you that they recognize themselves in the book, that they've got a grandmother who's just like Ursula, the central female character, or they've got a grandfather who's just exactly like the colonel. And apart from that, the book - to me, at least. Of course, I'm a bit prejudiced, perhaps. Mr. MARTIN: To me, the book seems timeless, also. It's a book like "Gulliver's Travels" or Rabelais or one of those books that, even when it first came out, seemed to have been around a long time. So, yes, I personally think it is the book that will his book. NEARY: Do you think that younger people are not as exposed to Gabriel Garcia Marquez is those of us of a certain age, that he's not read as much as he used to be? Or no? Mr. MARTIN: Well, I think he's not. I think that's clearly true. But I don't think it's as true as you might think. If you read anything about Garcia Marquez in the newspapers and you then go down to the bottom of the article and go the blogs these days, it's all young people. There are still 20s and 25-year-old people talking about all the things that they talk about. But Garcia Marquez is still - he's still, by a mile, the most recognized and recognizable Latin-American writer. And I see that Garcia Marquez is still extraordinarily popular among Latin-American young people. No question about it. NEARY: Gerald Martin is the author of "Gabriel Garcia Marquez: A Life." Thanks. It was good talking with you. Mr. MARTIN: Very good to talk to you, too. Thank you very much. NEARY: And that's our program for today. I'm Lynn Neary, and this is TELL ME MORE from NPR News. Let's talk more tomorrow.